First peel the oranges. Slice off the very top and bottom to create flat edges, then run the knife down each side to remove the skin and pith. Segment following the natural lines. 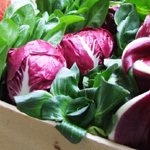 Chop or tear the mixed radicchio. 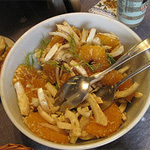 Toss together with the orange segments and some pumpkin seeds. The juice of the orange should dress the leaves and the sweetness of the oranges will naturally counteract the bitter radicchio leaves. Serve immediately. Thinly slice the washed fennel, dress with a drizzle of balsamic vinegar and leave to marinate on the side. Thinly slice the red onion and add to the fennel. Divide the orange segments and cut in half. Drain and roughly chop the anchovies. Add everything to the fennel, dress with salt, pepper, oregano and plenty of extra virgin olive oil. 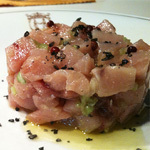 Mix together the finely diced swordfish, the grated bergamot zest and the olive oil, season with salt and pepper to taste. Swordfish has a quite intense “raw” flavour, so if you want to disguise it a bit, add the juice of the bergamot and the finely sliced spring onion as well. Spoon the mix into two small chef’s rings and press down until firm, then place in the fridge until it’s time for serving. Place the rings on the serving dish, remove them and garnish with a few mint leaves. You may drizzle some extra olive oil to taste. Place the peeled clementines in the blender on maximum speed for 1 minute. Pass the juice through a fine sieve. You will need 500g of juice. In a clean blender grind the sugar on high speed for 10 seconds. Add the glucose and clementine juice to the powdered sugar and blend on medium/high speed for 10 seconds. Pour the juice into clean ice cube trays and freeze for one day until rock solid. Place a clean plastic container in the freezer to chill, ready for the sorbet. Pop the frozen ice cubes into a clean cold blender. Crush the cubes, gradually turning the speed to high and blend at this speed for 1 minute. Scrape the sides down and repeat this process until the clementine cubes are smooth. Once blended, remove and whisk for a few minutes. 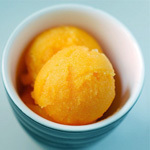 Scoop the sorbet into the chilled plastic container for later use or serve immediately.